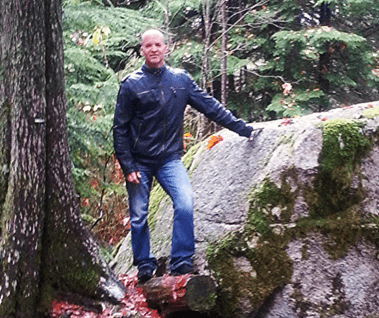 Robert currently resides in Mission, British Columbia, Canada where he creates his hand carved stone artwork. Robert has been involved in business for most of his career, with his main education background being in Mechanical Engineering Technology and Business Management. Robert has always dabbled in art, whether it be through painting or sculpture, having the natural ability to create. For the past 10+ years, he has focused his efforts on his stone carving and working to bring his pride and passion for his creations to the public. Personally he has always been an adventurous artist but found a strong passion connected to stone and ancient stone art. Growing up in Southern Saskatchewan, he remembers hiking through the rural grasslands with his father exploring the history through various artifacts found in stone including those man-made and those natural within fossils or rock formations. Robert also carries a strong interest in ancient civilizations and the stone carvings, stone art, and stone structures that were created by hand around the world by these various civilizations. Wonderfully crafted pieces made with the simplest of hand tools, which still survive and are appreciated today. He is driven to replicate that simple hand crafted process using only basic tools, to create a “one of a kind” art piece on a stone canvas that will last through time. Each hand crafted stone piece carrying its own uniqueness through its design, stone characteristics, and artistic creation. Aside from his very detailed stone sculptures, Robert also strives to bring art into common but creative everyday uses, by carving unique stone items that can be used within the home or for personal use as well. Whether a piece of stone jewelry, home décor bowl or a sculpture, each artistic creation is made with pride and passion, which he hopes gets passed on to the eventual owner. Simple, pure, artistic and unique stone creations! Even though these art pieces may be made from a common stone type, each has its individual aspects due to color, tint, inclusions, or grain. Each and every carving is also made individually by hand. Thus each item that comes from Rune Stonworks is unique. No one item will be exactly the same as another due to the stones individual uniqueness and the manual carving process. These items are not massed produced using power tools, dies or grinders. Instead to ensure a unique piece of art from the raw stone it is cut with hand tools to the overall rough dimension and size and then continually worked with hand scrapers, rasps, and files to create the one of a kind art that looks and feels like no other piece. The item is then sanded by hand at least three times, first using a 200 grit sandpaper, then wet sanding with a 600 to 800 grit sandpaper, and then a final polish wet sanding with a 1500 grit sandpaper. Final polishing includes heating the stone and coating it with a melted natural bee wax or rubbing with olive oil. This ensures a true natural hand made product from beginning to end. Yes, this is a longer process than if I was to use power tools, power sanders, etc., but that is not the reason I make this art. My intent is not to produce general mass consumer type products. I want to provide individually crafted artistic pieces, made by the simple process of using hand tools, providing high quality one of a kind art pieces that people can enjoy, show with pride, and pass on through generations. Simple, pure, artistic and unique! These creations are made with pride and passion, and that feeling carries through to you the owner in each piece purchased. Stones which are typically used include: Brazilian Soapstone, African Wonderstone, Alabaster and Black Chlorite. Below are some general characteristics associated with the various stones which I am presently using for my art. Colors: Some pure minerals occur mainly in one distinctive color, others may occur in many different colors. For the purpose of sculpture the purity of stone is not really a factor assuming that the impurities do not affect the ability of the stone to be carved. Because most stones are often a mixture of minerals it is possible to find the same types of stone in a never ending variety of colors and patterns. Aside from the carving process, that is what makes each stone art piece unique. (Hardness 1.0) Most commonly used to describe a stone that is predominately composed of talc from with its slippery feel it got its name. As a generic term it has sometimes been used to include stones that are often geologically related to Talc (eg. Chlorite, Pyrophyllite, Serpentine, and Wonderstone) and occasionally is applied to stones that are not related to talc at all. Soapstone has had many uses, including industrial use for countertops, sinks, cookware and hearths due to its resistance to heat, electricity, chemical, and anti-bacterial characteristics. Archaeological discoveries have shown that Talc was carved in ancient Babylonia to make signature seals. 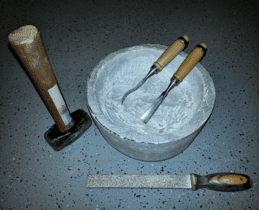 I like using Soapstone as it is relatively easy to carve with standard hand tools. Although the typical colors are brown or green, there are others as well and each can have some nice variations within due to other mineral inclusions. It also finishes very nicely. Soapstones metaphysical properties include treatment for skin problems. It is said to provide comfort to people in how to deal with issues, and development of personalities. It gives the wearer a sense of ambition and calm, assisting in getting used to new situations and to embark on new adventures and challenges. Regeneration of its energy can be achieved by burying it in the ground for a few days. (Hardness 2.0-3.0) Is a type of rhyolite but also covers Pyrophyllite. The most well known is a dark grey to black variety found in Africa, although there are additional occurrences in many countries throughout the world in a variety of colors. Obviously due to its hardness, it is a bit tougher to work with hand tools but it still is possible. I like the African Wonderstone due to its dense and solid structure. Sometimes you come across variations within the gray color which is unique. Pyrophyllite, which is a phyllosilicate mineral composed of aluminium silicate hydroxide: AlSi2O5OH, is a metamorphosed clay. The clay was formed by the alteration of volcanic ash, which apparently accumulated at the bottom of a quiet body of water. It forms a dense, but soft light grey, or darker grey stone. The strata, in which it occurs, is a 3.0 to 3.1 billion year-old volcanic sediment layer. Wonderstone is characterized as an excellent meditation stone, and it enhances creativity. It brings energies of tranquility, emotional balance and helps eliminate worries. It also helps reduce depression and anxiety, giving an overall sense of well-being. Wonderstone can also bring mental clarity in activities and give insight into the right course of action. It stimulates courage in speech and action, and is known to some as a stone of perseverance, resolve and protection. (Hardness 2.0 – 3.0). This term is often used to distinguish a group of similar minerals, but is often treated as one mineral. Most often in shades of green to black, but can be found in other colors. Due to its common occurrence with Talc and its relative softness, it is sometimes classified as soapstone. The finish on this stone is amazing, with a high gloss black. I love carving creations from it. In raw form it looks a dull gray, but once you sand and polish it the beautiful shine comes out. Chlorite is considered one of the most powerful healing stones. It cleanses and purifies the aura, chakras and other energy centers. It can remove negative energy of all kinds including; anger, hostility, illness and others. Creatively, it promotes a state of inspiration. The energy that chlorite brings to healing and the environment is extraordinarily positive. 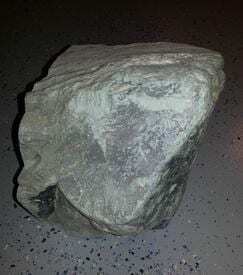 Chlorite is excellent in crystal and folk healing and is used to eliminate toxins from the body. It is particularly healing to the cells and helps their balance. It brings in energy to enhance cooperation and stimulates one’s personal affinity. It is also an extremely positive mineral and can help a person to visualize and create a more positive future. (Hardness 2.0). Alabaster is mostly white in color, but sometimes it will have hints of other soft colors as well. 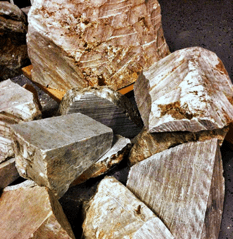 Sometimes referred to as Selenite or Gypsum. 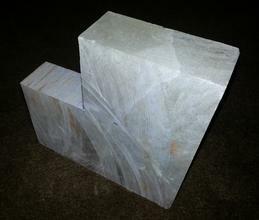 Alabaster is the stone of art excellence for sculptors due to its characteristic features. It is a crystalline form of the mineral gypsum, geologically formed millions of years ago as prehistoric lakes evaporated. It is white in its pure form but often has translucent veins or clouds within it. Alabaster is considered a drawing stone, meaning that it has the ability to draw things to you or draw things away from you depending on what your needs are. It removes negativity and soothes nerves. It is said to be a well-known light amplifier, bringing forth pure white light healing energy around its user and assisting the user to concentrate and think more clearly. The white color summons the spiritual. Alabaster does best with a sun cleansing. As an artist, you always wonder about the perception of your art and how it will be received by the public. Of course in an artist’s mind, each piece holds a special uniqueness and place of pride within. Having that art be appreciated by others is the best feeling that an artist can ask for. I truly believe that when something is made with passion and pride, those same feelings are bestowed to or felt by the owner. Below are a few special testimonials from my clients which I greatly appreciated receiving. If you would like to provide me with a kind comment on a product which you may have purchased, you can do so by sending me an email. I'm the proud owner of this unique butter dish (the edgy multi sided lid). It's absolutely one of a kind amazing!! The pictures don't do it justice. I gave specific measurements and the requirement of a lip on the bottom piece (so the butter didn't melt off in hot temperatures)... and this beauty was created by the artist. Unbelievable. Thanks so much it's a showstopping conversation piece! I love Robert’s creations! They are all unique and custom made. He works with great precision and care. You can tell how much he’s in tune with the stones he works on. I had a pendant designed by him from a picture I found online. He created a beautiful piece which I love to wear. Not only does it look nice, but I also enjoy the healing properties of the stone. I can recommend his work highly! Robert, the package (stone bowl) arrived on Tuesday which was excellent delivery performance by Canada Post. It was quite well packaged. It looks really beautiful. I applied a tiny bit of olive oil on the inside, wrapped it in gift paper and presented it to my wife on Mother's Day. She was very pleased with it and it now has a prominent place in our kitchen. Thanks for everything and best of luck with spreading these beautifully crafted pieces over North America. Top notch Robert! I love the custom hand carved bear paw pendant. These soapstone candle holders are perfect! Such a beautiful color and a great addition to my space. Shipped very quickly, too. Highly recommend! This item is absolutely gorgeous! I wasn't worried about slow shippping, but it arrived much sooner than expected. I will be using this with my Peugeot mill set. The wooden and stainless steel Peugeot mill stand doesn't hold the mills very straight. This thing is exactly what I wanted and looks so good! Thanks for the item and quicker than expected shipping! The spoon rest arrived today and I am elated with your work. It truly has a simplistic beauty and yet modern elegance. I thank you for your craft, your attention to aesthetic detail and even your packaging. What a value, and gift I feel I received for my stove top. I THANK YOU! Maintenance and care of your stone art piece is easy. Handling the stone is perfectly fine as oils from skin contact will just aid in its shine. Other than normal contact, you can also ensure a shine on the stone simply by rubbing it with olive oil whenever the stone gets dull. Fine scratches can be rubbed over with olive oil, or if deeper will require sanding with fine grit sandpaper (1500 grit for polishing). I suggest sanding the stone while you hold it under running water. After sanding, let the stone dry and then polish with olive oil several times. Although this piece is made from stone, it should be used and handled with care as it can still be damaged or broken like any other type of pottery, crystal, jewelry or art piece. After all, it is a piece of carved art and not just a stone. Please contact me if you have any questions on your hand carved stone art piece. What is required for maintenance or care on these stone carvings? Most of these creations are finished with a natural product such as melted beeswax or olive oil. To aid in the shine of your stone carved item, you can rub it with a clean cloth and a small amount of olive oil. This will give it a nice wet shine, and cover any fine scratches. Handling the stone is fine, as oils from your skin will also aid in its shine. 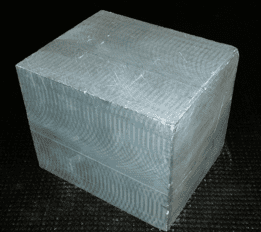 Soapstone is typically a softer stone, will it scratch? Yes, soapstone is considered a soft stone. I use this stone, as I typically focus on carving by hand with simple hand tools, which soapstone accommodates very well. It can scratch, particularly when scrapped with metal such as rings or steel utensils in the case of bowls, etc. For home décor items such as a bowl, you should use wooden utensils if you plan on actually using it instead of just having it for a formal display. Keep in mind that I typically finish these products with either a melted beeswax or olive oil, and not a lacquer or paint coating. This is because I want to keep the product natural from start to finish. If you want to coat with something to make it more resistant to scratches, you can use a product such as Krylon Crystal Clear Glaze spray. Keep in mind that minor scratches in soapstone can typically be addressed by rubbing the item with olive oil and a soft cloth. Deeper scratches can be sanded out with 2000 grit sandpaper. For a sold item, can I get another one similar to it? From a design perspective, yes, however I cannot guarantee the exact stone color replication of any creation. Brazilian soapstone can vary widely in color. When I purchase the raw stone the color is gray, and I can usually only gauge the tone of the stone, but not what the final color with inclusions will be. These color variations is what makes the stone so unique. So I can assure you a tone (either brown, green, etc.) but not an exact replication of the same color. If you like something you see, please contact me and I will confirm what can be made, cost, etc. I would like to have you carve a special item for me, what is required? If you see something in my gallery that you like but is already sold or if you want something new created, please contact me and I will be in touch to work through the details. Aside from understanding what you are looking for, I would need to understand what stone and tone color you would want, along with size, quantity, etc.. Once this detail is worked out, I normally provide a formal quotation. If you decide to proceed, I normally would require a 20% down payment on the purchase (minimum $25.00) with the remainder being due prior to shipment. I usually provide pictures of the final product, prior to shipment to ensure it meets with your expectations. For larger commissioned sculptures, payment installments may be arranged depending upon the total art sculpture value. How do I determine sizing for a bracelet/bangle? You can view detailed information on this by looking at the bottom of my "Fashion" web page below the listing of bracelets. Custom sizes can be created. Please contact me for confirmation, stone availability and cost. For custom designs, I can provide various designs, widths and even provide with carved emblems or silhouettes (i.e. music notes, initials, etc.) on the bracelet making them truly "one of a kind items". For your home décor creations such as your spoon rests or coasters, are they resistant to discoloration caused by food, drink (wine) or heat? Yes, soapstone is well known for its resistance to high heat, acids and alkalis. Soapstone has been used in laboratories for sinks and counters due to its resistance, and even in fireplaces for its heat resistant characteristics. Soapstone is said to also have naturally anti-bacterial qualities. I have a stone sculpture that I purchased many years ago from somewhere else and it was accidentally damaged. Do you repair stone sculptures? Yes I do offer repair and restoration services for stone sculptures of any size or stone type. Contact me and we can work through any details. Is this stone breakable if dropped? Although these creations are made from stone (typically Brazilian Soapstone), they should be used and handled with care as they can be damaged or broken like any other type of pottery, jewelry, crystal or art piece. After all, it is a piece of hand carved art and not just a stone. Do you accept custom orders for commercial retail or corporate gift requirements? Yes, I am open to such considerations. Please contact me to work through the details. As all my items are created by hand by myself, time estimates to produce may vary depending upon requirement and quantity. Custom requests should be ordered well in advance. I have provided items on several occasions, for corporate Christmas gifts for clients. This is quite unique, and support of the artisan community is very appreciative.